Suffering from allergies in Tampa FL can make life very difficult. It's time to take control of allergies in your own home. Chem-Dry of Tampa has the solution. Get a carpet cleaning for your allergies. Your carpet is a giant filter in your home. It traps all the pet dander and pollen that comes in contact with your floor. This is better for your allergies than you think. By trapping allergens in the carpet they are no longer in your breathing zone. Your carpet actually helps to keep your allergies at bay. The only real problem is sooner or later your going to have to get those trapped allergens out of the carpet. That's where we come in. 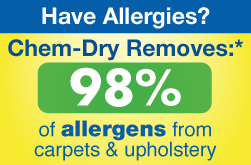 Chem-Dry of Tampa has an exceptional carpet cleaning service that works great for people with allergies. Our hot carbonated extraction cleaning service removes 98% of the allergens from carpet and upholstery. Pulling the allergens out of your carpet and upholstery restores your home back to an allergen free zone. Wouldn't be nice to breathe easier. With our Healthy Home cleaning service we can remove 89% of air borne bacteria as well. Our cleaning service actually makes your home a healthier place to live. Chem-Dry of Tampa FL's green certified cleaning solution rinses away cleaning leaving no dirt attracting residues. That means your carpet stays cleaner longer with less maintenance. Only Chem-Dry offers hot carbonated cleaning services in the Tampa FL area. If you're suffering from Summer time allergies its time to get your carpets cleaned for allergies. For carpet cleaning for allergies in Tampa FL call Chem-Dry of Tampa.